One of sport's most infamous contracts is about to come to an end. 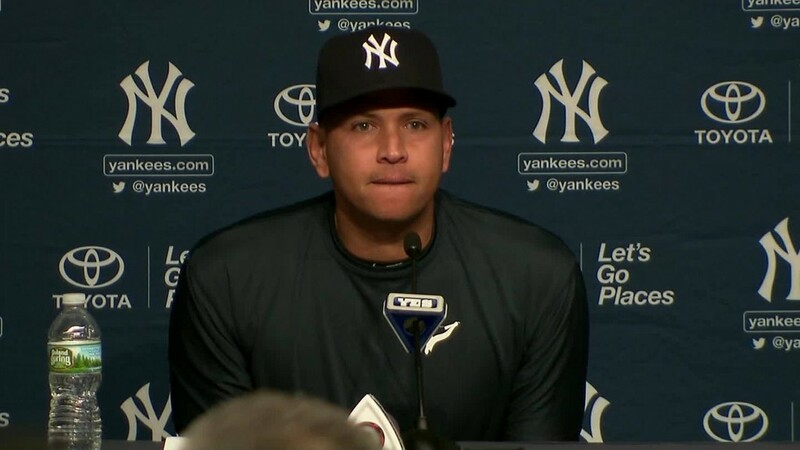 Alex Rodriguez announced Sunday that he will retire on Friday, ending his 22-year baseball career. 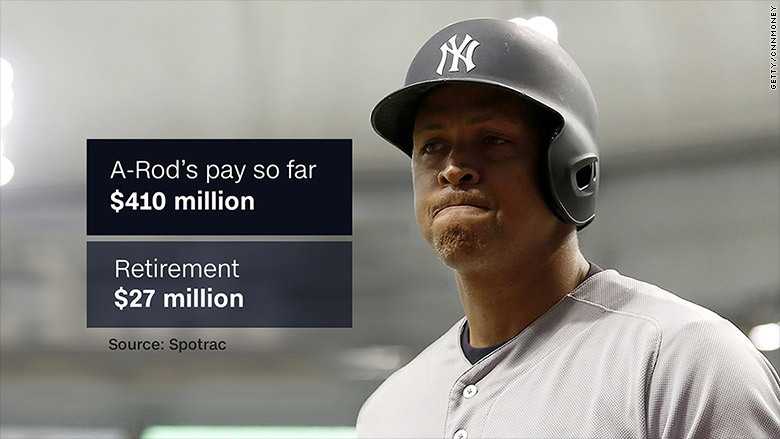 Despite putting up Hall of Fame numbers, A-Rod has received some of the most oversized paychecks ever. Over two decades, A-Rod has been paid about $410,000,000 to play baseball, according to data collected by Spotrac, a research service that tracks sports contracts. And he'll be paid another $27 million or so as a spectator. Today, the New York Yankees designated hitter is in the ninth year of a $275 million contract. The 10-year pact is the second richest in baseball history: The Florida Marlins' Giancarlo Stanton is being paid $325 million over 13 years. What did the Yankees get for their money? A-Rod helped deliver a World Championship in 2009, and largely put up above-average numbers with his bat. But his defense was a liability, and he was often injured. And, of course, Rodriguez was forced to sit out the entire 2014 season after being suspended for using performance enhancing drugs -- a development that caused the Yankees much agita but saved the team about $20 million. This year, A-Rod is making $21 million. He turned 41 last month, and age caught up with him. His batting average is just .204, and he has a mere 9 home runs and 29 runs batted in. While Rodriguez is retiring, he won't need Social Security. Formally, the Yankees have "released" him from his player contract and signed him as an adviser. But baseball contracts are guaranteed: A-Rod will collect approximately $6 million he has coming the rest of this season and $21 million for 2017. "The contract he negotiated is in full force," Yankees general manager Brian Cashman said Sunday. "Every aspect that he's owed will be paid, as the contract states, the rest of the way." Rodriguez's contract saga started in December 2000. That's when he left the Seattle Mariners to sign what was then the biggest contract in individual sports history -- a 10-year, $250 million contract with the Texas Rangers. The team struggled with A-Rod, and Texas traded him to the Boston Red Sox in 2003. The Red Sox got Rodriguez to restructure his contract, allowing him to play for less money. But the players' union didn't like a player agreeing to play for less and effectively nixed the deal. Instead, the Yankees traded for A-Rod in 2004. To complete the deal, Texas agreed to pay $67 million of his remaining $179 million deal. In other words Texas paid more than a third of Rodriguez' salary for him not to play there anymore. A-Rod opted out of the final three years of his deal after the 2007 season, ultimately signing his $275 million contract with the Yankees. In 2015, he passed Willie Mays' 660 career home runs, earning a $6 million bonus. Upset about A-Rod missing the 2014 season, the Yankees balked at paying the bonus, and the team and Rodriguez eventually agreed to a deal that allowed the money to be donated to charity. -- CNNMoney's Chris Isidore and Jackie Wattles contributed to this report.